Operation Cedar Falls was a military operation of the Vietnam War conducted primarily by US forces. 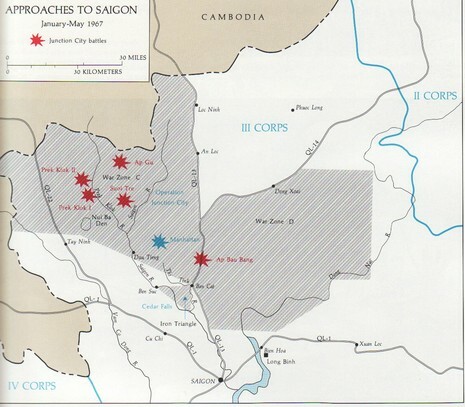 The aim of this massive search and destroy operation was to eradicate the so-called "Iron Triangle", an area located in close proximity to Saigon which had become a major stronghold of the communist National Liberation Front (NLF) or Vietcong. The operation began on January 8, 1967 and ended on January 28, 1967. Operation Cedar Falls was the single largest ground operation of the Vietnam war: Two Army divisions, one infantry and one paratrooper brigade, as well as one armored cavalry regiment participated in the operation; altogether, Operation Cedar Falls involved 30,000 US and South Vietnamese troops. The Vietcong, however, chose to evade this massive military force by either fleeing across the border to Cambodia or hiding in a complex system of underground tunnels. Nevertheless, the allied forces uncovered and destroyed some of the tunnel complexes as well as large stockpiles of Vietcong supplies. In the course of the operation, so-called tunnel rats were introduced for the first time to infiltrate Vietcong tunnel systems. 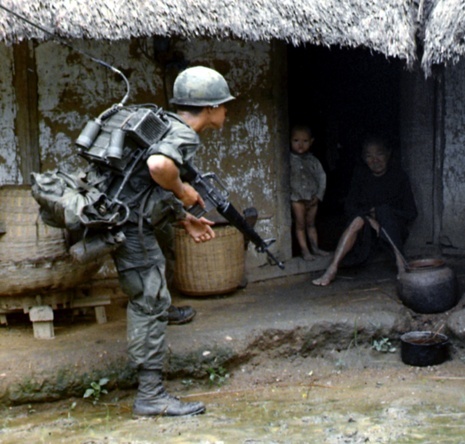 In an attempt to permanently destroy the Iron Triangle as a Vietcong stronghold, Operation Cedar Falls also entailed the complete deportation of the region's civilian population to so-called New Life Villages, the destruction of their homes, as well as the defoliation of whole areas. Most senior officers involved in planning and executing the operation later evaluated it as a success. Most journalists and military historians, however, paint a bleaker picture. They argue that Cedar Falls failed to achieve its main goal since the Vietcong's setback in the Iron Triangle proved to be only temporary. Moreover, critics argue that the harsh treatment of the civilian population was both morally questionable as well as detrimental to the US effort to win Vietnamese hearts and minds driving many into the ranks of the NLF instead. Therefore, some authors cite Operation Cedar Falls as a major example for the misconceptions of the American strategy in Vietnam and for its morally troublesome consequences. This offensive, the largest of the war to date, was designed to disrupt insurgent operations near Saigon, and had as its primary targets the Thanh Dien Forest Preserve and the Iron Triangle, a 60-square-mile area of jungle believed to contain communist base camps and supply dumps. During the course of the operations, U.S. infantrymen discovered and destroyed a massive tunnel complex in the Iron Triangle, apparently a headquarters for guerrilla raids and terrorist attacks on Saigon. The operation ended with 711 of the enemy reported killed and 488 captured. Allied losses were 83 killed and 345 wounded. The operation lasted for 18 days.